I contemplated starting this off by declaring myself an Anglophile. Then, after giving it some serious thought (eight seconds), I realized that’s not entirely accurate. I have no real interest in the history of England. Nor am I interested in the architecture or most of the culture. I simply am an avid consumer of British entertainment. And I also find the Union Jack’s aesthetics to be wonderful. I also really wish I had an English accent, but some things are just not meant to be. My three favorite musical acts are all British. The Beatles, The Smiths, and Depeche Mode. If I had to count Morrissey separately from The Smiths, he’d be in the four spot. Hell, probably the majority of my top ten acts are probably British as well. Except I don’t have an official top ten. “Favorites” list that are officially ranked past the first five places are uncivilized. I first saw my favorite currently running show, Extras, after downloading episodes that aired on the BBC. Even just saying “BBC” is fun. “What’s on the BBC tonight? ‘Are You Being Served?’ Ugh. Well, looks like I’ll be reading a book!” Awesome. Which leads us, of course, into the subject of English candy. When I was in London, I bought a Big Kat, before they were introduced in the US. I am rather surprised they made the trip “over the pond” (awesome), because Big Kats are awful. You completely screwed up the chocolate to crisp ratio, Hershey! Some things are simply too delicate to be messed with. Point being, my history with English candy is not an entirely great one. Until, that is, about a year ago when I first saw the wrapper for the Yorkie bar. I didn’t care what kind of candy it was. What drew me in was the wrapper, which is attention grabbing to say the least. Next to the Yorkie name, was a big picture of the symbol for the women’s bathroom, in a crossed out circle. That’s a horrible description. Is there an official term for those crossed out circle things? That sounds like a child describing it. Beneath the name and symbol, is the tag line “IT’S NOT FOR GIRLS!” What the hell? Upon seeing this, thoughts raced through my mind. What kind of food is this, that makes it unacceptable for girls to eat? Is it made of synthetic testosterone? Beard stubble? But of course, people who aren’t ignorant or involved in politics realize that the “IT’S NOT FOR GIRLS!” slogan is meant completely in jest. It’s not offensive. If it is, it’s offensive in the same way Mountain Dew’s advertising is offensive to the elderly or out of shape. Or in the way a BMW ad is offensive to poor people. Or, most accurately, it’s as offensive as calling a large TV dinner a Hungry Man. Actually, I take that back. Hungry Man TV dinners are offensive. How dare they insinuate that I would reduce myself to eating something like that? I’ll stick to my string cheese and ramen noodles, thank you very much. As is often the case, all of this excitement faded, and my interest in this curious item waned fairly quickly. Until the day one arrived at my door. Without warning. I literally had no idea it would be arriving. I was expecting a package from someone, and this had been thrown in there as an extra accompaniment. As if something of this magnitude could be “just something extra”. 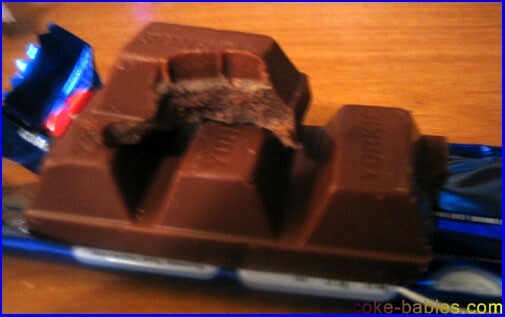 The inclusion of the Yorkie bar was described by the sender as “a surprise”. An understatement of that magnitude borders on perverse. Having this sent to you unannounced is a surprise on the level of finding out your father is actually your own son. Yeah, it’s that deep. And there it was. In my hands. Its shiny blue wrapper, filled with delicious misogyny. But what do I do with it? That answer wound up being rather simple, and pretty inglorious: leave it on my desk. I will admit, I am usually awful at making decisions. My answer to where I want to eat is “I don’t know”. My answer to a yes or no question is “I guess”. I don’t know what I want to order from the drive thru until it’s my turn, forcing me to go into a panic, and order $12 worth of food from Taco Bell. It also happens at restaurants; I don’t make up my mind until the waiter asks me, which results in me hurriedly picking something, and being filled with immediate remorse. Given that enthralling history lesson, it is understandable that I didn’t do anything with the Yorkie bar. What could I do, eat it? Absolutely not. Then I couldn’t show it to people. I couldn’t show it to girls and say, “You can’t have this; it’s not for you.” I know what you’re thinking, but don’t be too surprised… sometimes my humor does get that intellectual. Eventually, I gave up. I couldn’t resist. I had to know. What lay beneath the confines of the wrapper? Was it a hulking mass, awkward and lumpy like a Baby Ruth? In fact, that’s the only thing I thought it could be. What better shape for a manly candy bar than the shape of man himself: awkward and lumpy. It would be a deep, rich brown. With lots of pieces sticking out. It will contain almonds, peanuts, Twizzlers, bolts, entire Brazil nuts. This is what must make up such a glorious, manly piece of food. So I did the unthinkable… I disrobed the mighty Yorkie bar. Come on, are you kidding me? The legendary Yorkie bar was simply a bland looking series of boxes? IT IS PLAIN MILK CHOCOLATE. Then I became self conscious. Was I feeling this disappointment because I was not meant to enjoy this? Was I somehow breaking their “NOT FOR GIRLS” commandment? Were they demeaning my masculinity? Well screw that. At least I’m not the one that tastes like crap. When I get a Hershey assortment, the first thing I do is what every other sensible person does: immediately try to get rid of the plain Hershey bars. Whether that means giving them to someone who doesn’t know any better or throwing them out, it doesn’t matter. Just get them away from me. And Krackle barely makes the cut; it gets the chocolate GED. So don’t tell me that I am expected to take a mound of milk chocolate and like it. And don’t you DARE tell me that not liking it makes me less of a man. Trust me, there are many more things in my life that make me less of a man. Distaste for awful candy bars is not one of them. England, you may have your creative music, your wonderfully dry humor, your adorable accents and phrases, and a overall better way of life. But if you think you have superior candy output, you’re crazy. A Take 5 bar kicks the Yorkie bar square in the nuts. Oh I forgot, it doesn’t have any. OH SNAP.